Bluebloods » What makes a good broodmare sire? What makes a good broodmare sire? There are many theories that attempt to select the next great broodmare sire. One is that stallions who leave a high number of superior race fillies will in turn become good broodmare sires and as far as theories go, this one appears logical. Statistics show good race fillies, as a group, are more likely to be good broodmares. Therefore, as those good race fillies go to stud and leave good progeny, this reflects on their own sire who then features as a good broodmare sire. To test this proposition seems fairly straightforward. Simply take the list of stallions who have won a Champion Broodmare Sire title, and investigate each horse’s record as a stallion. If this theory is correct, readers would expect to see a high number of superior race fillies among each horse’s record as a stallion. During the past 65 years, there have been 31 stallions to win a Champion Broodmare Sire title in Australia. All left at least one Gr.1 winner during their stallion career. Across the group, they left on average seven Gr.1 winners, headlined by Danehill with 89 (the all-time record). As a dam sire, he already has 63 Gr.1 winners to add to his impressive resume. To get down to the nitty gritty of the question, how many of those 31 stallions left a high number of good race mares? Of those title winners, seven of the 31 (23%) left more female Gr.1 winners than male. At the other end of the scale, three (10%) did NOT leave a filly who won a Gr.1 race. That leaves 24 stallions who left more male Gr.1 winners than female Gr.1 winners among their own progeny. At first glance it would seem the theory has been blown apart. The question any reasonable scientist would ask now is this. Is the theory at fault, or is the way we have tried to measure the answer at fault? In part, the measurement is at fault because there has been no benchmarking done to work out an industry standard. If you look at this set of stallions, they collectively had 49% filly foals and 51% male foals. However, only 46% of their runners were female, and only 40% of their stakes winners were female. This appears as a bias against the success of their fillies and mares, however, these figures need to be matched against the general population. In 2015-16, only 42% of all runners in Australia were female; and only 36% of stakes winners were female. And that’s even with several races being restricted to fillies and mares. It appears there is a slight bias against racing fillies and mares across the entire industry. As a group, this subset of 31 Champion Broodmare Sires actually outperforms the Australian population in terms of participation and success for fillies and mares. To use this bias as a benchmark against which the Champion Broodmare Sires are measured, the question then becomes: How many of these stallions left more than 36% of their stakes winners as fillies and mares? 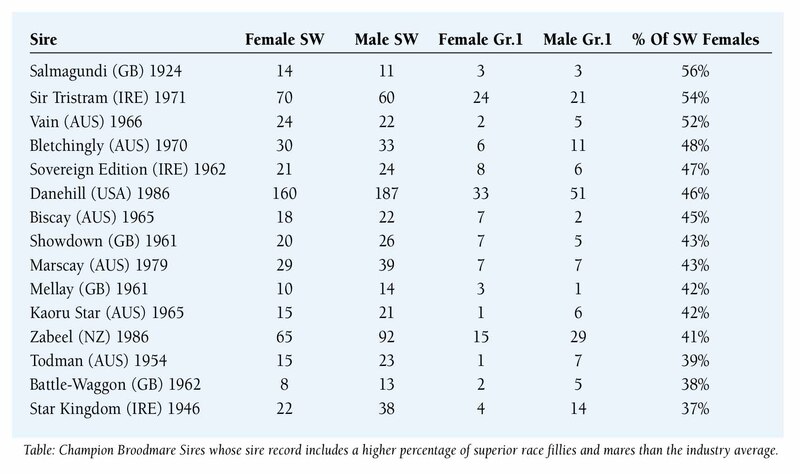 By this measure 15 of the 31 stallions (48%) left more than the expected percentage of female stakes winners, four (13%) left the expected percentage, and the remaining 12 (28%) left a lower ratio of female stakes winners than expected. On face value, it looks like there is some basis in this theory as around half of all Champion Broodmare Sires have a greater than expected number of good race fillies and mares. Like all questions posed in horse racing, there is no simple answer and there are many other factors involved that impact on the outcome. All the stallions on this list who had a lower than expected ratio of good female racehorses were born before 1961. Perhaps they also outperformed the expectation for fillies and mares in their own eras? 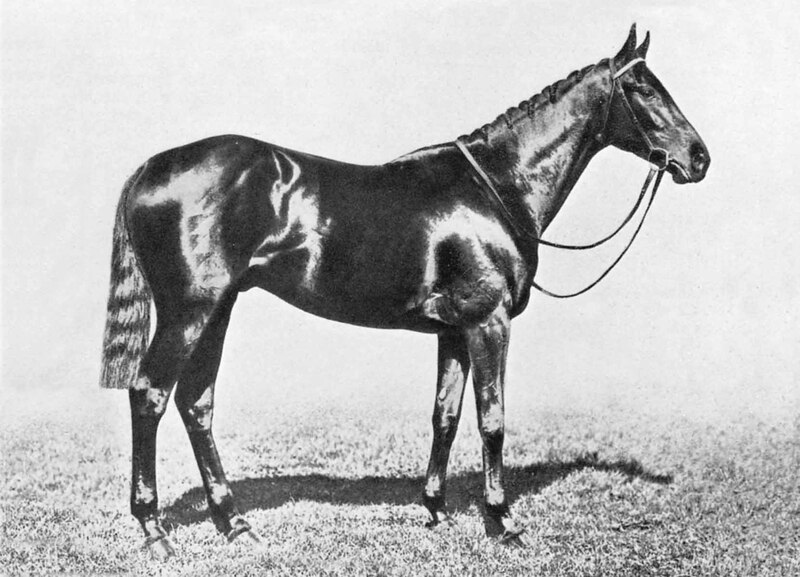 A horse like Magpie (Dark Ronald-Popinjay by St Frusquin) was born in 1914 and left seven stakes winning fillies and 25 stakes winning males, but how did that compare to the general population in that era? He left 65 stakes winners as a broodmare sire, including Hall of Fame inductees Shannon (Midstream-Idle Words by Magpie) and Delta (Midstream-Gazza by Magpie); as well as champions like dual W.S. Cox Plate winner and seven-time Gr.1 winner Hydrogen (Delville Wood-Sweet Sound by Magpie). Without having access to the population figures before WWII, it is difficult to say whether the proportion of fillies in work, and winning stakes races, has changed over time.